So today I thought I’d try my hand at Voxel rendering. Rather than existing in a 2D image plane with an X & Y coordinate Voxels exist in 3D space with a position in the X, Y, & Z axes. A prime example of the use of voxels in rendering is the popular game Minecraft. In Minecraft randomly generated terrain is modelled as large fields of voxels with each voxel rendered as a textured cube. Because the terrain is not just a surface coated in triangles but rather a volume with internal data, the terrain in minecraft can be modified and changed during runtime with little effect on performance. Voxels are useful for displaying other kinds of volume data too. CT Scans are medical images which capture 3D density plots of a patient’s body. By capturing density at each location throughout the scanned tissue the data can be replayed using a computer to literally look inside the body and see where possible irregularities and illness may reside. In my second year at university I was given a Computer Graphics coursework to read in and display the data for a CT Scan. It was very low resolution, only 256 * 256 * 113 voxels in size but it worked well for the purposes of the coursework which was simply to demonstrate the ability to parse the volume data into usable slices (not that hard). There were several bonus sections to the project such as histogram equalization and density bounding to eliminate tissue we didn’t care about. Another one of the bonuses was for rendering the volume data in 3D with a hint of using trilinear interpolation. At the time the work load we were under was horrendous due to the year long group engineering project, so while I eagerly completed all of the other bonuses I just didn’t have time to get 3D working. Until now. It’s not pretty, and in fact it’s really not pretty when you make it 3D due to the low input resolution of the scan. But there it is! 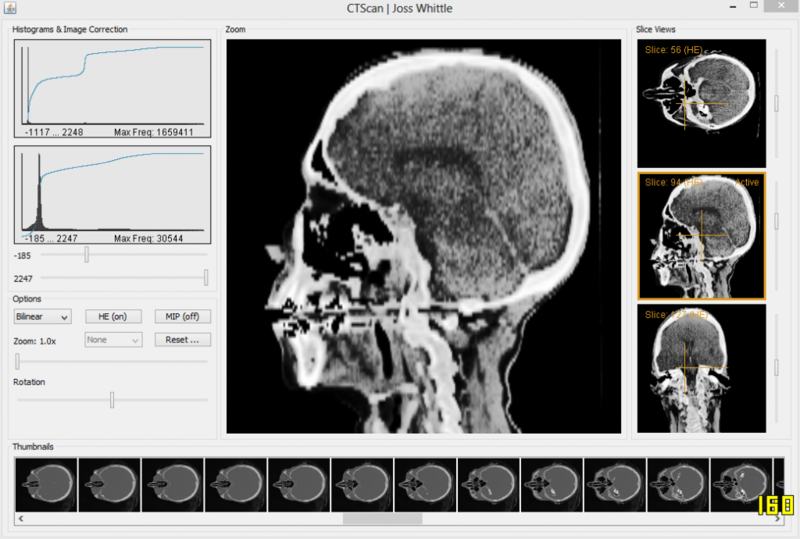 The same CT Scan now rendered in 3D in OpenGL. I used the Java bindings for OpenGL (JOGL) so I could use the same loader code I wrote in 2nd year to parse the binary CT file into a 3D array of shorts.